Theophilus Gbenda is a journalist at Culture Radio, a community radio station in central Freetown. In this interview, which has been lightly edited for length and clarity, Gbenda talked about the three times he was arrested by the authorities for things he said, what this means for the state of journalism in Sierra Leone, and how a Rastafarian radio station can help lower the national blood pressure. My name is Theophilus Gbenda. I am the Project Coordinator of Culture Radio F104.5, in Freetown, Sierra Leone. Culture Radio is a Rastafarian-based radio station, and so we bank on the pan-African ideology. The main objective of the radio station is to promote our culture and to also promote black consciousness so people will become proud of who they are, and don’t feel inferior when they see other races. We say we are all created in the image and likeness of the most high God, and so we should see ourselves as one. The key message we propagate is the message of peace and love, because we think if we love each other there will be automatic peace. We also believe that there will be no peace without justice, and so we really focus on promoting an enlightened society, because we believe when the people are well-informed about things happening around them, they will be in a better position to make informed decisions. We ensure that all our programs are people-friendly, to the extent that for each and every program, we either open the phone line to get feedback from the public, or we allow them to send text messages. And we are actually the voice of the voiceless. That is why many people refer to the station as the people’s station. Our station has kind of become a complaint center where people come in and out to bring in complaints about things happening with them at their workplace, at their schools, at the colleges, at home and all of that. If you come here in the afternoon, you will see a lot of people coming to just bring up issues to us. You know, we live in a country where the majority of our people have lost confidence in the judiciary, they have lost confidence in the police, they have lost confidence in even the governance system. So they now turn to us journalists and the civil society. And for us at Culture Radio, all we want to achieve is to give voice to the people. By doing so we will be able to reduce the anger level. Given the economic situation in the country you will find that most people are very much disgruntled, they are disenchanted, they are very much disappointed, because they were expecting much from the current government., but what they are experiencing right now is the opposite. Taking into consideration the fact that we are just coming up from a bloody civil war that left thousands of people killed, and the fact that most of the factors that led to the war are still very much with us, we are sitting on a time bomb that could explode any time if nothing is done to right the wrongs permeating the society. And one way we think we can do it as a media institution is to allow people to express their grievances over the media. Once they do that, that automatically reduces the chances of them going violent. And in the process of doing that, because we expose the ails in society, the government doesn’t seem to like us. Obviously, because they always want to work with journalists who they can play ball with, journalists who can lie in bed with them and all of that. But because we pride ourselves as being the people’s station, we cannot afford to be compromised or neutralized. Attempts have been made over the years to get us neutralized through bribes, through intimidation, through some other forms, but we have so far refused to be cowed or to be neutralized. So for me personally, as the man doing the most critical program in the station, called Burning Issues, I have always had problems with the authorities one way or the other. The first problem I had was with the former Vice President of the Republic. There was an issue between him and one ordinary citizen whose land the former Vice President forcefully took form him. And so the guy came here and complained, and I tried to get the side of the Vice President. He happens to be my uncle. But of course, because I’m the type of journalist who doesn’t go to authorities, since he became Vice President I never went to see him. But of course I have his contact line, so when that issue came up, I sent him a text message — he did not get back to me. I called him several days — he did not say anything to me. The other text I sent was the direct issue – I explained the entire issue to him just to get him to respond and he refused. So I went ahead. I hosted the guy, the complainant here. He said a lot of things about what transpired between him and the Vice President, and the Vice President took offence, even though I had tried to get his side. So I went to the police, and by the time I got there a detention order had already been prepared for me and signed, even before obtaining a statement from me. All because it had to do with the Vice President, the number two man in the country. So I was locked up for three days – two days actually and on the third day I was released. I wasn’t charged to court, and so it was just a matter between me and the Vice President, using the police to get me intimidated. The second one [incident] had to do with a satirical piece I floated in my WhatsApp group. I have one of the most popular WhatsApp groups in the country, it’s named after my program. The group is called Burning Issues Forum. That group is comprised of a number of top people in society – lawyers, doctors, journalists, civil society actors, university students and so on and so forth. So I posted during the height of the Ebola that one of the doctors who was in the center of things, Doctor Russel – it was just, like I said, a satirical piece – that Doctor Russel “tasted” Ebola. Right? Tasted, T-A-S-T-E-D. They took it for “tested,” T-E-S-T-E-D.
Why I said “tasted” is because all the medical doctors who died passed through his hands. And so the rumor was all over the place that Doctor Russel has also contracted the virus. So I said with my satirical piece – which I did not mention on radio, but my social media group – that Doctor Russel has “tasted” Ebola. It was just a joke to give an indication that, you know, he has been in the center of it and that the medical doctors who died passed through him and that his name is all over the place that he has tested positive for Ebola. They took it out of proportion and then he went to the police because he happened to be one of the personal doctors of the President and also the Vice President then. And so they were looking at the implication of the doctor of the President being associated with Ebola. So that is why they took it out of context. This one too, the police called me and I responded, they said they wanted to see me at the CID [Criminal Investigations Department] on Friday. So I said, well I would rather come on Monday, because their tactic is when they get ahold of you on Friday then you don’t expect to be released until Monday. So I said I will not go there, I will wait for Monday and I will go there. And on Monday I went there. Again by the time I went there they had already prepared a detention order for me. So by the time they finished taking my statement, the detention order was already in place, and I got to know that because I saw it in one of the books, signed with my name there and everything. Then for the third one, it had to do with an analysis I did on the controversial nature of the last elections. I referred to it as a stolen mandate because the indications were clear that the president did not win genuinely and that the whole election process was skewed in his favor. According to the results he obtained 58 percent of the total vote, and by the time of the holding of the election, the country was under a state of emergency, which means the election was held under a state of emergency, which means people going to vote had to go through soldiers and police officers holding guns. And as soon as they finished voting you were asked to go directly to your house and then the result was not announced until the evening hours, between 5,6,7 o clock. Almost immediately they were preparing to swear in the president. Why the rush? In Zambia the opposition cried foul and there was concern over the electoral result, they said they have put on hold the inauguration of the president there. But here it was a different ball game. By the time people even came out to say, “No, we disagree,” they were already swearing in the president. So I refer to it all as a stolen mandate. Because I said that, they arrested me and detained me for three days. But you know, I always see being detained as a privilege, because as a journalist you should be prepared for that. The way this country is now, journalists should come out clearly to say, “We are not afraid of your intimidation.” You can beat us, you can keep us in custody, no problem. As long as we are able to do our job without fear or favor. So that’s exactly the kind of category of journalist I belong. We have journalists in the country who are no longer serving their real purpose. They have actually become the bedfellows of the government. And so they cannot write anything critical or say anything critical about the government. You have some other journalists like us, who are attack dogs. We actually hammer the issues, we come out tough on the issues, we don’t care what the consequences are. So that’s the kind of journalism I am practicing. It’s a difficult thing to do because we have a situation that I would call media poverty. The media landscape is thriving as a matter of fact, but the journalists, who are the actual reporters, who go out to get the news, who are wallowing in a state of poverty. And even the media institutions are also thriving in poverty. If you look at the newspapers, you see what I would call media capture. Most of the newspapers, they rely almost entirely on advertisements to keep their day to day running in place. For us at Culture Radio we don’t accept all types of advertisement because we believe adverts have the potential neutralizing our editorial standpoint. And so we are running as an NGO and we are having some kind of support from outside the country. For example we are having support from Germany, a group called Bread for the World. Bread for the World in Germany is funding us – like for every three years they give us 250,000 Euros. So that is what we use for staff salary, for the day to day operations of the cause, of the institution, and some other things. So for this alone we don’t have any business running after the same advertisement other radio stations who are not fortunate to be getting such sponsorship. So by that way we are able to come out strong on the issues. The political climate does not favor radical journalism. You either get arrested or get beaten or get killed or whatever. So you should be prepared for any of those. Secondly, you should avoid going for their money. If you want to be a critical journalist then don’t go for their money. When you go for their money it’s like going to the devil. Saying, “I want money, I want power, I want a child,” the devil gives you conditions. In the same way, if you go for politicians’ money, they always have the tendency of getting back at you if you go the other way. How were you treated when they detained you? Well I was treated humanely as a matter of fact – the only thing was that my freedom was seized. I was detained amongst other common criminals. For me that was just an experience to listen to those suspects to know what actually took them there and how they are being treated and all of that. They were happy having a journalist amongst them for just two days and at least they knew I would be able to take across their message, and I did that when I came back from the cell – I passed on their message. And the first time you were detained, you didn’t go through the IMC or the courts – you weren’t charged with anything. So essentially you were illegally detained? I would say so, because I was not charged. If there was anything criminal, I was supposed to have been charged. But you know, they didn’t charge me for the three times I was detained. The police are under pressure. Not that they always want to arrest journalists. But sometimes a minister will just sit in his office and call the police officer, “Gentleman, I want you to arrest this journalist for doing this and that and that, and then the journalist gets arrested. So sometimes the police, because they are not independent, because they are vulnerable, they work by the dictates of the politicians. And that I find to be very much unfortunate. They detain journalists because those journalists are not dancing to their tune. For me, that is the most critical reason why they want to detain journalists. Journalists who are dancing to their tune have no problem. You see them going around with jeeps, you see them going around with…you know? Flashy stuff and all of that. But for us, we are actually sacrificing everything because we want to give people the very best. And where this country is right now, journalists are actually supposed to speak out even louder. During the civil war, a number of journalists were killed, a number of journalists were targeted. So if we journalists should sit by and see things going wrong and we don’t walk about those issues, then we are not only doing a disservice to the nation, we are also jeopardizing our own safety in the long run, should anything happen, like it happened the last time. You know, they were looking for journalists. We don’t want to be in that situation anymore. That is why we are now actors, instead of being just reporters. For us at Culture Radio, because of our NGO look of things, we don’t limit our work behind the mic. We organize workshops. In other words, we target the issues before they become news. Because we don’t take pleasure in always reporting negative things. The unfortunate thing is that in our country right now, evil has dominated good. You find out that journalists have more negative things to write about than good things. So for us journalists who are on the critical side, our notebooks are always full with issues to deal with. I’ve been learning that the authorities don’t even necessarily have to use the libel laws to intimidate journalists. Oh yes of course, of course — the libel laws are just there as reference. They are just there as reference. But with or without them – for me, I’m not afraid of the libel laws. All you need to do, do your job professionally. Just do your job to the best of your ability, and be mindful of the pitfalls and make sure you don’t fall into their trap. So is it common that they would just arrest a journalist without a reason or formal charge? Yes, of course. It’s common. Recently one deputy minister arrested a journalist because the journalist asked him a critical question. And even yesterday a journalist was arrested. He was invited to the house of Parliament, and then the Parliamentarians ordered him arrested by the police, and he was released on bail – just yesterday. You mentioned people have tried to bribe you – what’s the story behind that? What effect does it have on your work as a journalist if you’re always facing these threats and intimidation? For me, like I said earlier, being detained for example, bring detained is a privilege for me. So I don’t get bothered with that actually. Because if you say you’re going to take that too personally, then you might as well just leave the job. Because even when I’m doing my program, people who are not even in my studio are the ones raising concern for my safety. But I don’t get myself worried about that. “Today I cried, I screamed, I shook and a part of me died. He could accomplish anything he wanted to. He was one of the best in the business I ever knew. He was smart. of the Sierra Leone Association of Journalists (SLAJ). This is a transcript of the interview, which has been lightly edited for clarity and length. What’s the story behind how you helped found Awoko as an independent newspaper? I was reporting for international radio – Voice of America, Radio France International, Radio Deutsche Welle. We were going to the source to get the stories. Like for example, during the war we were going to the war front to interview people there to get the news firsthand. And we found out that we were the only ones who out there getting the story firsthand. Most of the journalists here, after we had gone over the radio and had broadcast our stories, that is when they would take those stories and publish in the newspapers. So I said to myself, why don’t I start a newspaper — because I always get the big stories, I get them first before most of the journalists here. The journalists here are very lazy, they always wait and copy from what you have done. So that was what motivated us. But I didn’t have enough money, so I brought together two other friends and we then came up with money to start. But this was not my first attempt. I started journalism working for a newspaper. Even after college I tried to work with some other people to set up other newspapers and to run them. So then after the war and all these things were happening, I had the opportunity to do it. And that was how Awoko started. Who were the friends who helped you start Awoko? One of them owns the Citizen Radio now, he’s called David Tam Baryo and the other is called Joseph Rahall – he’s also a journalist, but now he’s moved into the NGO world, he now runs Green Scenery and he is one of those advocating for land rights. Was Awoko an independent newspaper right from the beginning? Yes, right from the beginning. The background I came from is, if you’re reporting for an international news agency, you have to be very objective, nonpartisan. You have fewer newspapers now who are independent. But this was not what it was like in those days. In those days you had independent newspapers. You had Party papers, which were obviously run along Party lines, ideology. You also had the government newspaper. And so you had to find a niche in between. Why are there fewer independent newspapers today? Well the reason is that the brand of politics that came in in 2007, the ruling party wants to control everything. It wants everything under its control, and so you have a lot more politics involved in all areas. And as a result of that you find out that the newspapers all became skewed towards politics. In fact it became either or. Either you are for this party, or you are for the other political party. In 2007 the government came in with, I would say, a lot of handouts for journalists. A lot of the journalists who were supporting the party got rewarded by being given diplomatic press attache positions. And so it became lucrative to support and publish along lines supporting the ruling political party, in the hope that you too would be rewarded with the high-paying diplomatic press attache job. And obviously those who were left out, who were considered to have been working with the opposition political party, those ones became real opposition mouthpieces, they too are hoping that if the party they are supporting comes into power, they will be rewarded with diplomatic positions and get high pay. So because of the love of money, it was left with only a few of us who decided to play the middle of the road, and so being perceived as impartial, nonpartisan. If it became easier for those who supported the ruling party, did it become harder to run an independent newspaper after 2007? Considering the trappings of money and influence, it certainly became a challenge to stay as an independent publisher. What are the biggest challenges for journalists and editors in Sierra Leone today, as you see it? Well, we are practicing under a cloud of repression. The spirit of the law says you can publish, but the spirit of the law also says if you cross the line, you will be punished. There is the criminal libel law, and the criminal libel law criminalizes free speech. So continuing to practice under that law means you are ready to face the threat of the consequences. How does that law affect the way journalists and editors do their work? It has cowered journalists into submission. Journalists can go just that far, and they can talk just that far. This law applies to criticizing government officials, right? Yes. If you do that you’re going to held, you’re going to be locked up, spend some days in jail. As the editor of Awoko, has this been an issue, where you’d want to pursue some story, but it’s just not worth the risk? The thing is, this law hangs like a sword of Damocles over your head. There is always the threat over your head. And a lot of people cannot bear that threat, so they step out of journalism. We are ready to risk it, as we can continue to publish even when that law is there. When you say risk, does that mean it’s not always clear when a story is potentially libelous? How sure can journalists be whether something they’re writing is risky? This law is unique. All other laws say you are not guilty until you are proven to have committed the act, and then they say you’re guilty. This law, the criminal libel law, says you’re guilty. And the worst part of it is truth may be inquired into, but it is not a defense. And the bedrock of journalism is publishing truth, unveiling the truth. If the truth is not a defense, then anything you do has the risk of you being jailed. Because it is not whether you publish the truth or not, it is just whether you publish. As long as the government official doesn’t like it, you are in jail. And that’s the cloud underneath which we are practicing, which makes it repressive and inhibits the best coming out of us. I don’t think any journalist publishes something knowing fully well that if I publish this, I would go to jail. If he knows that, he would not publish it. But then, the burning spirit in us is to reveal the dark truths and we sometimes are not mindful what are the consequences. The fact is, we have to come out with those dark truths for us to force change in our society. And if in the process you are arrested, then you go and suffer the consequences and come out again. How does the Independent Media Commission (IMC) detract or contribute to journalism in SL. Is it a positive or negative addition? The background for the IMC is that there had been too many cases in which journalists were taken to court. So we wanted to find a way of stemming that. And so we proposed a system of gradual self-rule. It was thought that when the IMC came in it would start regulating, and sometime in its lifetime, the rule and regulations would have stuck in and nobody would be violating them. And so with that self-censorship, that self-regulation, we would then disband, dismantle the IMC. So the idea was that journalists and editors would learn and internalize the regulations? Yes, having your own internal regulatory unit. We wanted people to come complain to the IMC where the issues are resolved quickly before taking them to court. After the IMC it’s not the end of the road. If you still feel aggrieved you can then go to court. I went to a press conference where representatives of Parliament were responding to rumors that Parliament had embezzled money. A member of the IMC who was att he conference said there are a lot of false and damaging rumors spread in the media. He seemed to be saying that because this was a major problem in Sierra Leone, it justified these legal restrictions. Well from that angle, that is his feeling, and I cannot defend him. But from my own angle I would admit that yes, a few of the guys step over the line. But generally speaking the media performs very well, both radio and print. But in any situation you have some bad eggs and some bad apples. And definitely we have some really bad apples. And how does that affect the journalists who are doing good work here? It affects them because when one journalist does something that is bad, people tend to generalize and look at use that to classify all of the other journalists, and that is not a good thing for us. Are there some issues that should get more coverage, but because of the legal situation of journalists, it’s too risky? Well there are quite a few. Because of the presence of this law again, you cannot go overboard and talk a lot about government issues. But over and above that, people are not too open to talk and give interviews. Like the banking industry is very secretive, you can hardly get them to talk. The insurance industry too. And perhaps out of a fear of being misrepresented in the media, they are all media shy and refuse to talk extensively to the media. And because people don’t open up and talk to the media, journalists are usually frustrated in finding stories, and getting people to say things which they can quote to back up their stories. In its report on journalism in Sierra Leone, Freedom House mentions the financial difficulties of practicing journalism here. Can you talk about this? It is difficult. The pay is not too good, and because the pay is not too good, in a lot of media houses there is even no pay. And because there is no pay, journalists want to go to workshops and press conferences where they are given handouts as transports. So instead of going to look for the hard news you would always see them giving workshop story news and press conferences. But all that is because people who have money are prevented or are scared of investing in the press. Because the laws, especially the criminal libel law, is tailored in a way in which the proprietors are held responsible for what the journalists do. And because it is criminal, they are taken to jail. And so ordinary businessmen only want to do business. They cannot do that with the journalism industry because of the law. So the owner of a newspaper could get in trouble for something a journalist does? Yes, the owner is in trouble, the printer is in trouble, the vendor who sells the newspaper is in trouble. And we have seen examples of innocent people in those categories who have been taken to jail, who have suffered. It’s really striking how rural Sierra Leone becomes once you leave Freetown. Even though it’s the second largest city, Bo has basically no grid of streets. Venture just a little ways outside the city center and you’ll reach pothole-ridden dirt roads. There doesn’t seem to be any old colonial buildings, and the City Council building is a big house surrounded by trees and grass. And to get there, you pass through a simple community with no paved roads, where women wash and dry clothing outside. 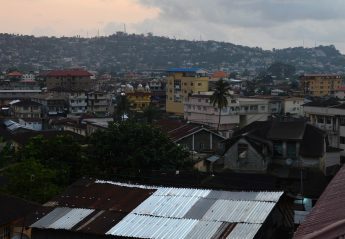 The bus ride from Freetown to Bo took about five hours. There were many several stops, and at each one there were people ready and waiting to sell their goods to the passengers: fruit, peanuts, cucumbers, biscuits, skewers of meat, whole roasted fish, water, soft drinks, bread. At one stop, a women held up three live chickens she was hoping to sell. Our first stop when we got to Bo, after eating at a former Awoko staffer’s house and settling in, was the offices of Kakua Chiefdom, which contains Bo. Sierra Leone is divided into 149 Chiefdoms, each headed by a Paramount Chief. Though these leader are elected, candidates must come from one of the ruling families recorded at the time the British colonialists set up the system, and in some areas women cannot hold the position. The Chiefs have a lot of responsibilities in their local area, and also hold seats in Parliament. Kakua Chiefdom, which contains Bo, is having trouble collecting enough local taxes to pay employees, which is what my story was about. Despite the problem of not being able to raise enough taxes, for reasons I don’t quite understand the Paramount Chief said he would like to do away with these taxes altogether. The next day we went to the Bo Waste Management Department to learn about their recycling program. It turns out this program is one of, if not the only one in Sierra Leone. The the right infrastructure, education and attitudes toward recycling basically don’t exist in Sierra Leone right now. The recycling efforts in Bo include turning plastic, much of it from sachets of water people take as refreshments, into paving stones, which line the walkway to the Waste Management Department. There are other products made of plastic waste, like bags, and aluminium cans are melted down and poured into molds to make pots and pans. At the Waste Management Department we learned that it’s hard to make a profit from these recycled products because they’re labor-intensive, and there’s so far no way to automate the production. Later we got to see first hand how the products are produced at the recycling plant. We also visited a shop that sells bags made of recycled plastics. It was exactly the kind of thing you’d see in a shop in the US that sells souvenirs from around the world, but it wasn’t geared toward tourists or anything like that. Bo is famous for its gari (also spelled garri). What is this? It’s cassava (aka tapioca) that’s been grated, drained of its liquid and then fried in oil. The result looks like couscous but has the crunchy texture of fried onions. In my guidebook’s chapter on Bo, it says people in Sierra Leone are obsessed with gari, and will travel to Bo and bring back sacks of it. Judging by my colleague…this is completely true, as it’s exactly what she did. While riding motorbike taxis on the way to do some reporting, we made a detour to a gari shop, and she bought a huge sack of it. This morning (with no prior notice) I went with my colleague to the Sierra Leone port to cover a visit by former British Prime Minister Tony Blair. It was pouring, and we and lots of other journalists basically spent the morning chasing after his “entourage” trying to snap pictures, not get soaked, and overhear while he talked to people from his charity, all without knowing what they were talking about or what exactly the visit was about. Finally he gave a two minute press conference (my colleague asked the first question! ), and it was over. I wish I’d learned more Krio before I left for Sierra Leone. Although most people in Freetown are able to English — some haltingly, many very well — Krio is the language people use in all but the most formal situations. It’s a really useful language for visitors to know, or at least be familiar with. Krio is captivating to listen to and has a fascinating history. As an English-based creole, English words form the basis for most of the vocabulary. It started out as a pidgin language used for basic communication. But despite the similarities Krio is not pidgin or simplified English — it’s a separate language with a consistent and full grammatical system. Originally the language of the Krio people, who were black settlers of Freetown who came from Britain, Canada, the United States and Jamaica and other African countries, Krio was influenced by the English dialects of all these people, especially Jamaican Creole. It was also influenced by African languages, both local and those brought by settlers, and by Portuguese. Even though there are a lot of commonalities between English and Krio, it’s hard to understand the full meaning of Krio sentences, especially when people speak fast. Once I got more familiar with the pronunciation system (which makes a word like “but” sound like “boat” or “like” sound “leck”), and learned some of the grammar and words specific to Krio (they have a word for second person plural: “una”), I was able to understand a lot more — but still only about 50 percent most of the time. The percentage understandable depends on how fast people are speaking, and how much I know about the subject. One thing I like about Krio grammar is the way it marks tense. A particle pronounced “day” is used before verbs to indicate present tense. “Ah day go” means “I’m going.” The particle “go” before a verb indicates future. And there are two particles to mark different kinds of past tense: “done” and “bin.” They’re obviously from English, but the way they’re used is different. You can hear Krio in a more understandable form in the clip below. It’s selections from an interview conducted by one of my colleagues with the chairman of a slum in Freetown. The interview covers how the slum is preparing for flooding, the destructive floods last September, and life in the slums, including what kind of business people do, whether the children go to school, and how the police work in the slum (basically, they don’t go there — the slum has its own law enforcement, my colleague said).